Prester John was Rajadhiraja Chola II (Prince Jadaron Bagrutuni) the first Christian Emperor of the Three Indias. He was the grandson, through his mother, of Kulothunga Chola II, the Cholan (Soli) Emperor of the Three Indias. His father was a Christian Bagrutuni Prince Aton of the Ossetes. Wikipedia states: "According to historian N. Sethuraman, Rajadhiraja was not the direct descendant of Rajaraja Chola II but was a son of his sister. Rajaraja Chola II chose Rajadhiraja as his heir in 1166 as he did not have any sons of his own." 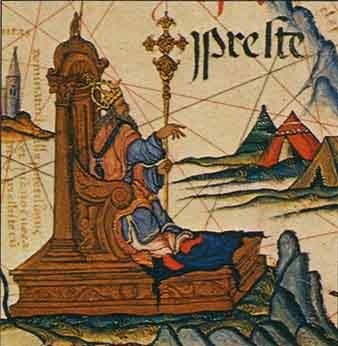 Prester John was succeeded by his younger brother Kulothunga Chola III when Prester John retired to be a Christian monk/hermit. Kulothunga helped Prester John's son Vikkirama Pandyan by his Pandyan wife to become the Pandyan King. Vikkirama's son Jatavarman rebelled against his Cholan cousins but was defeated and submited to Cholan overlordship. Jatavarman's brother Maravarman on succeeding him attacked the Cholans and became the Emperor of the Three Indies. He restored the policy of religious tolerance in the Empire like his grandfather Prester John. However his son Maravarman Sundari II was defeated by Rajender Chola III the grandson of Kulothunga Chola III. Maravarman II's son Jatavarman III seized back the throne of the Three Indias. His son Maravaramban was killed by his illegitimate son Vira when he declared his legitimate son Sundara as his heir. Civil war broke out and Sundari asked for Muslim help. The Muslims eventually seize power for themselves. Sundara's daughter who married the Australian/ Javanese King of the Rubani, Gadi and Mani is proclaimed Empress of the Three Indias and from about 1350 until 1530 her descendants, who followed an Indianised Jewish-Christian faith, reigned as the Prester Johns or Pandyan Emperors of the Three Indies. 1. Rajadhiraja Chola II (Jadaron) (r. 1163-1178) the first Prester John and Christian Emperor of the Three Indies.The so-called Voynich manuscript is a 15th century copy of the original which was written by him in the 12th century. The language is the Hebreo-Georgian Indian language of the Royal House. His son by his black Pandyan wife was King Vikkirama Pandyan. 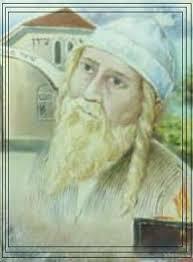 He had at least three sons by his Jewish wife Lady (Geveret) Hana. His son David Soslan became a Babylonian Exilarch (1175) and the husband of Queen Tamara of Georgia (1187). 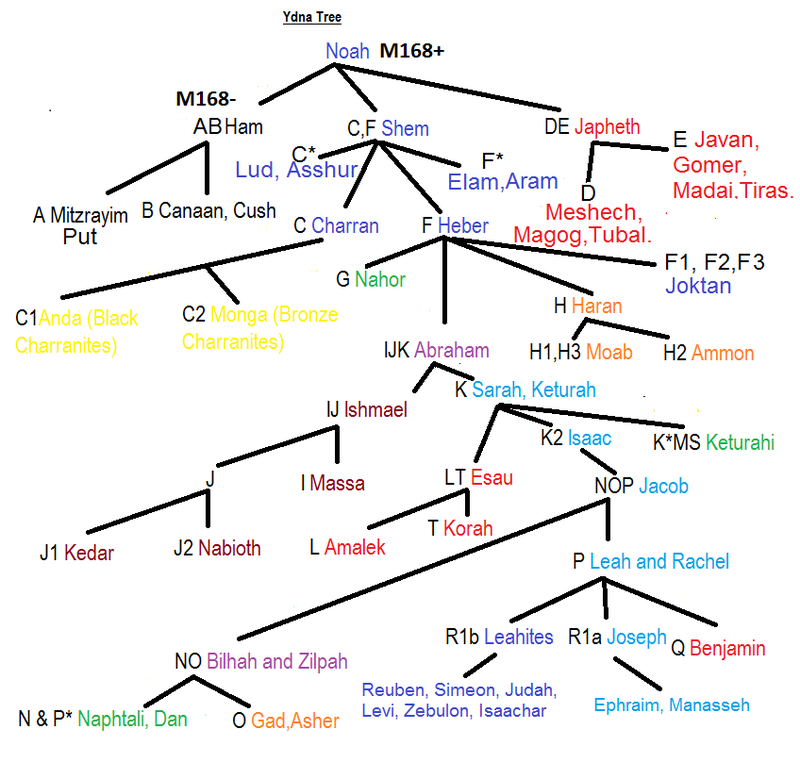 His son Hanan (Hani) became the Prince or King of the Jews of Tehama. 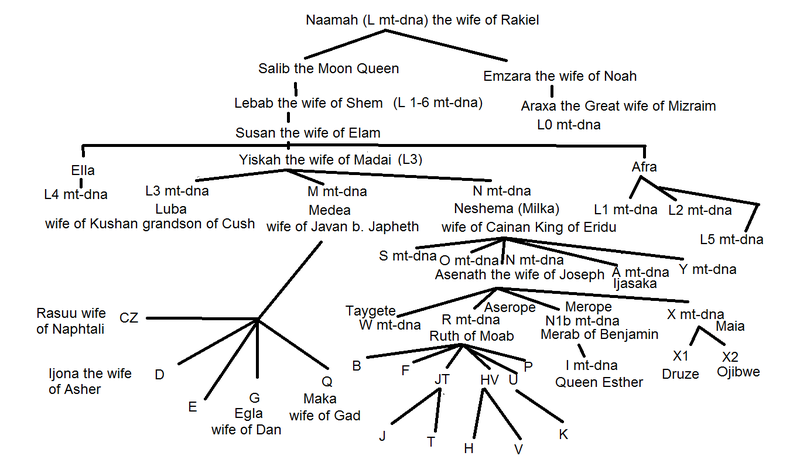 His son Solomon (Soli) was the Jewish Prince or King of Telmas who married Queen Lembu (Lebanah) of the Rubani. 2. Vikkirama Pandyan (r. 1180-1190) was assisted by his cousin Kulothunga Chola II the Hindu Emperor of the Three Indias to gain the Pandyan throne. Vikkirama was the protector of Christians and resisted the approaches of the Muslims for him to convert. The form of Christianity they (the Pandyan Prester Johns) followed was expressed in terminology drawn from the Hindu tradition. Just as the Chritians of the West saw the mythologies and legends of the Greeks and Romans as seeds of the Gospel so these Christians saw the Hindu writings as containing seeds of the truth. They developed the ideas of Vishnu and Krishna in a Christian direction where Krishna was identified with Christ and Vishnu as the Supreme Deity of which Krishna was the incarnation of Vishnu- Krishna is "The Lord himself" (Svayam Bhagavan). The idea of the ten avatars of Vishnu originates in the Kabbalistic idea of the ten sefirot. The concept of Devi (Mother Goddess) is close to the ideas of Sophia in the West. Radha is connected to the Holy Spirit who is seen as feminine in many Jewish texts. After the ascendancy of Hinduism after 1308 this Christian Indianised theology was re-assimilated back into Hinduism with its followers. He had two sons Jatavarman Kulashekharan I and Maravarman Sundara Pandyan I by his wife who was a Christian Cheran Princess of Quilon (Venad) in Kerala. 3. Jatavarman I (1190-1216) succeeded his father as the Pandyan King. He rebelled against his Cholan Hindu cousins but was defeated and was given back his throne as a vassal of the Cholan Emperor. He was succeeded as Pandyan King by his younger brother Maravarman. He married his cousin the Cheran Princess Kothi. 4. Maravarman Sundara Pandyan (r.1216-1238) defeated the Cholan Emperor and became the second Prester John Emperor of the Three Indias.He married his cousin Princess Radha the daughter of Solomon I (Soli) the Jewish King of Telmas and Queen Lembu (Lebanah) of the Rubani, Gadi and Mani of Java Le Grande (Australia). 5. Sadayavarman Kulashekharan (r.1238-1240) was the older son of Maravarman and succeeded him as the Prester John Emperor of the Three Indias while his brother Maravarman II was the Pandyan King. He married a Hoysala Princess. 6. Maravarman Sundara Pandyan II (r.1238-51) was the younger brother of Sadayavarman and was the Pandyan King from 1238-40 and then from 1241-1251 he was the Prester John Emperor of the Three Indias while his nephew Sadayavarman Vikkirama served as Pandyan King. 7.Jatavarman Sundara Pandyan III (r.1251-1268) was the son of Maravarman Sundara Pandyan II and was the Prester John Emperor of the Three Indias. "Jatavarman avenges the defeat of his father by completely destroying the Chola empire and establishing the second powerful Pandyan empire. He also defeats the Cheras, Hoysalas (in 1279), and the Kakatiyas. The Temples were the "Churches" of the Vishnu-form of Indianised Christianity followed by the Pandyan and Cheran Dynasties. This form of Vishnu-Krishna Christianity was first embraced by the Cheran King Rama Kulasekhara the founder of the Venad Dynasty of the Kingdom of Quilon in Kerala around 1100 AD. 8. Maravramban Kulasekharan Pandyan (r.1268-1308) was the son of Jatavarman Sundara Pandyan III and the Prester John Emperor of the Three Indias. He reigned with the help of his brothers who were also considered Pandyan Kings. After he was murdered by his illegitimate son Jatavarman Vira Pandyan, civil war broke out between his legitimate son Jatavarman Sundara Pandyan and designated heir and Vira. It lasted for many years and eventually led to Muslim control and rule of India. 9. Jatavarman Sundara Pandyan (r.1309-1327) was the legitimate son of Maravramban Kulashekharan Pandyan. During his reign he battled his half-brother but he defeated him and they allied against the enroachments of the Muslims. They apostatized from their Christian faith to follow Shaivism and it was during his reign that the Vishnu-Krishna Christians were persecuted and encouraged to become Hindus. He married a Majapahit Princess Tribuwana in 1324 and his only daughter and heiress Pandia Sundari was born in 1325. On her husband's death the Majapahit Princess now the dowager Empress of the Three Indias returned to Java La Grande (Kedar section of Australia now under water and called the Naturaliste Plateau) with her daughter Pandia Sundari in 1327. She remarried to the Raden (King) David III Kertawardhana of the Rubani, Gadi and Mani. On the death of Tribhuwana's immoral and degenerate half-brother in 1328 her mother Dyah Gayatri the dowager Queen of Majapahit and Amazon High-Queen had her daughter made Queen of Majapahit and Tribhuwana also became the Regent for her daughter Pandia Sundari who the Kingdom of Majapahit claimed as the Regnant Empress of the Three Indias. Queen Tribhuwana appointed Gajah Mada in 1329 as her Prime Minister who started to conquer back the countries of the Second India who had broken from the Empire during the civil wars that had occurred since 1308 in the First India. It was around this time that Ethiopia was considered to be part of the Third India due to its alliance through marriage of the Royal Dynasties of the Third India in Australia (Java La Grande) and the Islands of the Indian Ocean. On her mothers death in 1350 Tribhuwana became the Amazon High-Queen and her son Hayam Waruk became the King of Majapahit Kedar. Tribhuwana was also the Duchess of Kahuripan (Medang and Kedar). 10. Pandia Sundari (r.1328-1370) Empress Regnant of the Three Indias (Srivijaya, Majapahit and Vijayanegara Empires). 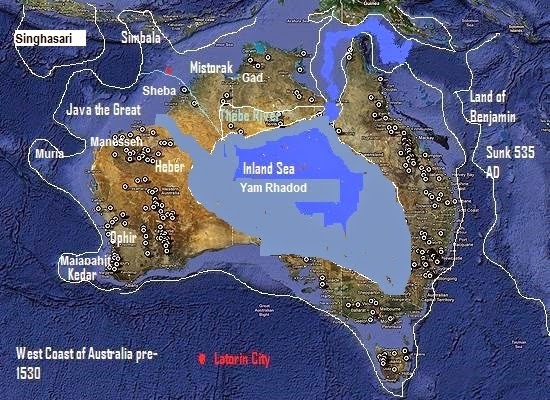 She married King Joseph II (Raden Sotor) of Rubani, Gadi and Mani (Kingdom of Rhodan Heber (Chabor) in Inland Australia on the edge of the Shallow Sea (Yam Rhadood [רָדוּד]). On the death of her mother around 1370 she became the Amazon High Queen. Her son Solomon III (Raden Gagak Soli) became the Prester John Emperor of the Three Indias and her daughter Radha the Queen Consort of Majapahit (wife of King Wirbhumi) eventually succeeded her as Amazon High Queen. 11. Solomon III (Raden Gagak Soli) became the Prester John Emperor of the Three Indias in 1370 and he married his cousin Princess Surawardhana of Majapahit (Kedar) the daughter of Prince Singhawardhana the Duke of Paguhan and Princess Iswari of Majapahit (and the Duchess of Pajang) [a daughter of Queen Tribhuwana and Raden King David III Kertawardhana of Chabor]. 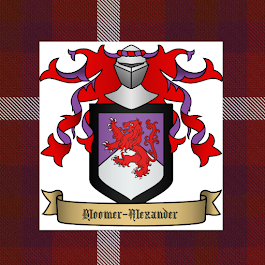 Solomon succeeded his father Joseph II Raden Sotor as King of Rhadan Chabor (Heber).